Allting som har med gammalt hederligt pappersrollspel att göra. I am thinking that who ever sent for me will want to use my character as a way to oust my uncle Gorm and gain power. I am a Noble Ridder and my father was a Lendmann. I made it in the Lands of Fire and am Rich (from Noble), starting with 1500 gold scields and have 5000 gold scields as a yearly income. 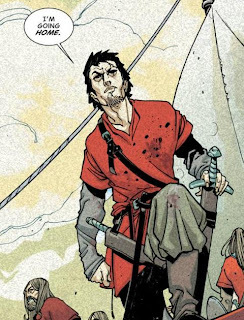 Björn, looks like your noble concept should work fine, since Sebastian's skald is the only other character idea we've got so far. As a noble, you'll also have control of a "Resource" (village, mine, sawmill, whatever), so come up with some ideas on what exactly that is, although I don't think we need to fully detail it at this point. My father lorded over a settlement close to the coast. It was called Grimness. Not a major town by any means but not a village either. It had a crumbling stone wall and 20 huscarls when I left. It survived mostly on fishing and some trading, mostly from taxing the merchants who had to stop over there on their way to the larger towns further up the coast. It had maybe 50 families living there and their thralls. For your NPC followers, one will need to be a seneschal who's been running it in your absence; the others can either have been with you in the Lands of Fire or they can have remained "back home" helping to maintain your Resource or other concerns in the area. Well, the problem is I have no one back home that I can trust. That's the reason my uncle Gorm could take over. Everyone knows I am the rightful ruler after my father but Gorm claimed I died long ago in the Lands of Fire. Likely there's just as many who wants to see me claim my birth right as there are those that prefer Gorm's ways. Of course, I can think of three sturdy and trustworthy brothers who I'd like to accompany me back to the lands of snow and ice. The Grim brothers….. Either way, you should think about what kinds of support you'd need to maintain your lands and noble position rather than automatically making them all warriors. Well, how much administrative stuff are we talking about. How much politics and stuff will there be? As far as setting the stage, I'm thinking about starting things out in late summer as you're just getting back from the Lands of Fire after extended adventuring there. Your father died about a year and a half ago and a boat was sent to bring you back and take his place. Does that work for you? bladerunner_35 skrev: I made it in the Lands of Fire and am Rich (from Noble), starting with 1500 gold scields and have 5000 gold scields as a yearly income. Under the Expansion's rules for Resources, the annual income from Rich/Very Rich/Noble is replaced with the profits from the Resource you control, but that won't affect the trial session anyhow. bladerunner_35 skrev: Of course, I can think of three sturdy and trustworthy brothers who I'd like to accompany me back to the lands of snow and ice. The Grim brothers….. I had a feeling you'd bring them up. I'm planning to run retainers/extras in general in a simplified fashion for this game instead of making them fully-developed characters like in Savage Marches, but I don't mind making an exception for those three. bladerunner_35 skrev: Well, how much administrative stuff are we talking about. How much politics and stuff will there be? That's largely up to you guys. If you don't want to deal with it, you can hire a seneschal to run Grimness for you once you've regained control, and that would allow you to do the standard "wandering band of heroes" thing. Alternately, you could develop some Knowledge (Stewardship) skill and manage the settlement yourself, in which case the game would tend to stay close to Grimness and probably turn more towards local politics and the like. I post in English, but can read Swedish. When replying to me, either language works. I should have posted this earlier for Willard and Rekreativc, since I don't think either of you have access to the Hellfrost Player's Guide: A list of appropriate Hellfrost character archetypes who aren't just "generic viking raider". Explorer: Wars and magic have changed the landscape over the last several centuries. Explorers travel widely, updating maps and recording the new wonders of the changed world. Grey Legionary: The Grey Legion mercenary company is the last refuge of those with nothing left to lose. They are fearless in battle, for they have no families or other close ties, leaving them nothing to live for aside from finding a meaningful death. Lorekeeper: Lorekeepers are dedicated to finding and preserving knowledge of the times before the Blizzard War. Raven Knight: The Knights Hrafn are dedicated to the perfection of military leadership, with no interest in politics. Many nobles seek to hire them for their strategic and tactical expertise. Reliquary: The Reliquary is an organization devoted to locating, studying, and protecting magic items. Individual members specialize as either Arcanologists, scholars trained to locate and identify items; Reliquae, experts in retrieving artifacts from dangerous locations; or Guardians of the Arcane, who protect the relics after they are returned to the Reliquary's Citadel. Scout: Fast and stealthy, scouts specialize in locating potential dangers and guiding others safely to their destination. Of course, if you have any other ideas, you don't need to limit yourself to this list. Willard, do you want to stay with the standard viking raider or do you want to take one of these ideas instead? On second thought, and on rereading the descriptions of the Hindrances, I don't think these quite fit. - A Blood Feud is supposed to be between two families, rather than within a single family. In this case, I think Enemy would be a better fit. - Orders seems to be intended for more of a direct, long-term relationship where you're working for someone or a group as their representative. I can't seem to find any good Hindrances to reflect that you're being used by someone else to further their own goals, so find something else to replace this one with, I guess. I think the huscarl concept fits quite well in the group, and I think it'll be fun to play. On the other hand, I've always liked exploration. Could I maybe have that as a "hobby"? Nothing as complicated as multi-classing (even if that were possible), of course, just as something else to do besides sharpening the old axe (or sword or whatever). That'd be even more fun! On a side note I quite enjoy administrative stuff, and the idea of staying around and "improving" an area around a settlement appeals more to me than that of just wandering around and pillaging. I would also maintain that this can be consistent with an interest in exploration and cartography. Hearing about the setting I can't help but think of the (old) game "King of the Dragon Pass". Have any of you heard of or played that? Willard skrev: I think the huscarl concept fits quite well in the group, and I think it'll be fun to play. On the other hand, I've always liked exploration. Could I maybe have that as a "hobby"? Nothing as complicated as multi-classing (even if that were possible), of course, just as something else to do besides sharpening the old axe (or sword or whatever). That'd be even more fun! I can definitely give you some Notice and Survival skills and the World-Wise edge to reflect a background in exploration. It doesn't make things any more complicated at all. And Hellfrost is a setting where it's important for someone to have decent Survival skill in any case, unless you all want to freeze to death when traveling. Willard skrev: On a side note I quite enjoy administrative stuff, and the idea of staying around and "improving" an area around a settlement appeals more to me than that of just wandering around and pillaging. I would also maintain that this can be consistent with an interest in exploration and cartography. I'm hoping to have some extra time at the end of the session on Thursday when we can talk about whether we want to continue with an ongoing Hellfrost campaign or not and, if so, what kind of campaign we want it to be. So we can discuss this sort of thing in detail at that point. Willard skrev: Hearing about the setting I can't help but think of the (old) game "King of the Dragon Pass". Have any of you heard of or played that? Hi guyz. As you may have seen in the other topic, Nya SL och nya spelare, I will join you on the 29ths. Here is my idea for a character, let me know how well do you think it fits with the rest of the group. I haven't had time to really look into character creation yet, so I'd be very happy if you can role a character for me. I am a young, but battle-hardened, Roadwarden. My motivation for the profession is an incident in my youth: My family was travelling to a local trade hub when we were ambushed by bandits. Our family was quite well off at the time, but bandits did more than just take our goods. They took my younger sister Yrsa, who was little more than a toddler at the time and my very favourite sibling. Ever since then I wanted to devote my life to keeping the roads safe, so other families won't have to suffer such horrible fate. Since then I patrol the roads keeping them safe. I believe in justice, but the incident cursed me with blinding hatred of bandits and outlaws, so my foes are rarely given the benefit of doubt and mercy is almost unheard of. I fight calculatedly, the battle fills me with an deathly calm and I never allow taunts or jests to sway my judgement. I use a shield and prefer to fight up close, using a shield to block my opponents, tiring them before striking the lethal blow. Those tend to be ruthless and messy, but then again Warhammers never leave a pretty corpse. I quite like the setting so I'm really excited about Thursday! BTW, since this will be my first time joining you, what's the protocol? Do I bring anything (snacks, something to drink) etc? Jag vill förbättra min svenska. Om du tänka min post kunde vara bättre, snälla PM mig. Tack! Rekreativc skrev: Here is my idea for a character, let me know how well do you think it fits with the rest of the group. For the first session, we're going to be starting out with Björn's ridder (I may have just missed it, but I can't find his name on the character writeup post) and his retinue on a boat returning to Grimness after several years adventuring in the Lands of Fire, far to the south. The boat itself was sent to find them a year and a half ago. A devoted roadwarden seems unlikely to be on that boat, since it would mean a lot of time away from the northern roads. If you have a reason why he would be there, we can go with that, but it might be easier to come up with another concept that would fit in more naturally, and then (assuming we decide to continue playing Hellfrost) you could decide after the trial session whether you want to switch to Wiglaf or continue playing the other character. Rekreativc skrev: I haven't had time to really look into character creation yet, so I'd be very happy if you can role a character for me. Rekreativc skrev: BTW, since this will be my first time joining you, what's the protocol? Do I bring anything (snacks, something to drink) etc? A couple people will usually bring snacks, but most don't. I don't think it's a big deal either way. nDervish skrev: For the first session, we're going to be starting out with Björn's ridder (I may have just missed it, but I can't find his name on the character writeup post) and his retinue on a boat returning to Grimness after several years adventuring in the Lands of Fire, far to the south. The boat itself was sent to find them a year and a half ago. A devoted roadwarden seems unlikely to be on that boat, since it would mean a lot of time away from the northern roads. If you have a reason why he would be there, we can go with that, but it might be easier to come up with another concept that would fit in more naturally, and these of then (assuming we decide to continue playing Hellfrost) you could decide after the trial session whether you want to switch to Wiglaf or continue playing the other character. Would it work if I just said Wiglaf was a Iron Guild Mercenary instead? Perhaps he joined because of the incident, but was then hired by Björn's ridder to join him on his adventure in the Lands of Fire? Rekreativc skrev: Would it work if I just said Wiglaf was a Iron Guild Mercenary instead? Perhaps he joined because of the incident, but was then hired by Björn's ridder to join him on his adventure in the Lands of Fire? Wiglaf was an Iron Guild mercenary guarding the final leg of a trade route moving goods by ship to the Lands of Fire, then by caravan to their final destinations. He met up with [Björn]'s company after his caravan was attacked, leaving Wiglaf as the only survivor. (Perhaps the attackers left Wiglaf for dead and Edwin (the group's skald) revived him? Or did he defeat the attackers with the newcomers' help?) Wiglaf then joined up with the group rather than wandering alone in the wilderness. Edit: Alternate version, in case you don't want another group of innocents killed on the road to be weighing on Wiglaf's conscience: The caravan arrived at its destination safely, then the caravan master declared that he would not be returning to Ostmark as originally planned and canceled your contract. The other PCs were the first group of (decent-seeming) northerners that Wiglaf encountered and he joined up with them because it seemed to be his most likely way to get back home. Yeah I like the alternative version better. That works great for me, thanks! So I can trust you to derive a character sheet from this description we've put together? As I've said I've imagined this character to be a slow-fighter, thinking about each move thoroughly and choosing the best action before proceeding. From savage worlds combat survival guide I can see Wiglaf using Smarts and Agility tricks to overwhelm his opponents and called shots to maximize the impact of his actions. Rekreativc skrev: From savage worlds combat survival guide I can see Wiglaf using Smarts and Agility tricks to overwhelm his opponents and called shots to maximize the impact of his actions. Given the way the mechanics actually work, you might want to consider taking some skill in Taunt or Intimidate for that purpose instead. Tricks give the target -2 Parry until his next action, so they're mostly useful to create openings for someone else to exploit, since you can't benefit from it yourself unless you get to act a second time before the guy you tricked gets a turn. (Which can happen if you go after him in the round when you do the trick, but it's never a sure thing that you'll get the higher initiative on the next round.) The +2 bonus from Taunt/Intimidate, on the other hand, will last until you use it, no matter how long that takes (as long as it's within the same scene). Mechanically, the only difference between Taunt and Intimidate is that Taunt is resisted with Smarts and Intimidate is resisted with Spirit, so pick whichever you prefer. Or pick both - if you have both skills at d6 or better, you can get the Strong-Willed edge, which gives you +2 on all rolls to Taunt/Intimidate or to resist them. I spent some quality time with the Hellfrost Gazetteer last night and decided that the my preferred location for Grimness would be on the northern Heligioland coastline, near the Seithrby border. (You can get a map of the entire northern continent at http://tripleacegames.com/Downloads/Hel ... ssilon.pdf ) The other major contenders were Midmark and Vestmark, but I decided to go with a loosely-confederated area with lots of ruins and assorted monster threats rather than a tradition-bound region in the midst of a conflicted succession (Midmark) or a dying, war-torn nation which has already half-fallen to the orcs (Vestmark/Orcmark). If you guys prefer either of the others, though, speak up! All of Rafnar's weapons and armor came for free as part of the Huscarl edge and I didn't see anything that jumped out at me as necessary for him to have immediately. If there's anything else you want to buy for him, just let me know. The Knowledge (Area) skills are based on what's near Heligioland. Feel free to select other regions if you want to. Also, either or both of the area Knowledges at d6 can be traded for two area Knowledges at d4 each if you want to spread things out a bit more. True, but it was unavoidable if I was going to give him both World-Wise (requires Smarts d8) and Huscarl (requires Strength d8, Vigor d6, and all four of his Agility-based skills at the levels he has them). The only other option would have been to reduce Agility to d4, which would have taken up 4 more skill points on his Agility-based skills, leaving only 1 point for anything else (aside from the Knowledge (Area) skills). The good news is that he's a wild card, so he's still got over a 50% chance to unshake for free each round and can spend a bennie to unshake and act if that fails. But if we continue with Hellfrost, I'd definitely suggest spending his first advance on getting Spirit d6, no doubt. Alright. I am working on my char now, hopefully finishing him soonish. Where exacly can I find the "Expansion's rules" of Resources"? bladerunner_35 skrev: Alright. I am working on my char now, hopefully finishing him soonish. Where exacly can I find the "Expansion's rules" of Resources"? The official title of "the Expansion" is "Hellfrost Rassilon Expansion" and the Resource rules start on p.92 ("Resource Management"). For the immediate purposes, what they boil down to is that Grimness starts with a Population of 2 (roughly 100 people per point of Population) and the base annual income is 2500gs/Population, so the same 5000gs as you'd normally get from Noble. At the end of each year, either you or your castellan (whichever is running the Resource) roll Knowledge (Stewardship) and get 100% of base income on a success, 200% on a raise, 500% with 2+ raises, 50% on a failure, or 10% on a critical failure. After determining annual income, you can spend a bunch of money on improvement projects and there's also a system for determining events affecting the Resource over the course of a year, but those parts aren't of immediate concern. Edit: The Resource Management rules are also available as a separate PDF, titled Hellfrost: Resource Management. Let’s scratch the idea of World-wise, it just seems to require too much of a sacrifice. Without that I don’t need d8 in Smarts, and would rather start with d6 in both that and Spirit. Looking at the other edges there’s a lot of cool ones, but I can’t really decide between them, and it seems more useful to just boost the traits with those points instead. So boost both Agility and Spirit to d8. I’d also prefer Code of Honor to Curious. The rules don’t seem to require any specifics there, but think along the lines of Hávamál (basically really old proverbs on how to be a good Viking, I’ll try to bring my copy) and a deep conviction in those ideas, rather than a couple of vows. With skills I’d invest two points each (enough to get me d6, I think) in Boating, Ride and Knowledge (Heiligoland, if indeed that’s where Grimness is). Three points each (d8) towards Fighting, Throw and Intimidation. That should sum to 15 points and meet the prerequisites for Huscarl. I’m not used to detailing back story ahead of time, so let’s just say that the blood-feud is a generations old rivalry between my family (let’s pick a new last name before we start as well, Rafnar is fine but that last name just doesn’t do it for me ) and another one back in Grimsness. The original reasons largely forgotten, but if this turns into a campaign I’d be open to exploring that from time to time. Willard skrev: So boost both Agility and Spirit to d8. I like your changes but wanted to add that while there isn't any dumpstat in Savage Worlds I don't think there's any real point in boosting Agility to d8. Generally you use skills when you need to be agile (unless there's a prerequsite for an Edge). Smarts, Spirit, Strength and Vigor all have their clear uses but so far I've been unable to find a good use for Agility, unless you have a whole slew of Agility based skills of course. Just thought I throw that out. My primary reasoning was that it's the primary trait for both Fighting and Throwing. With only d6 in Agility those skills would be more expensive, and I'd have to drop two points of something else. More generally I really am pretty interested in that slew of Agility based skills: four out of my six skills already use it, and there are a few others I'd like to acquire along the road. Even if there's nothing else to do with it, that seems like a good enough deal to me. First on the eternal argument of sword vs. axe. Usually I pick the sword, and that's what comes with the huscarl as written, but here I really get the feeling that Rafnar would prefer an axe. I was thinking of asking for permission to swap the free sword for an axe, but I realize that's pretty silly. I'll just buy one and have both! Third was Wiglaf's desire for taunts and other Smarts based combat maneuvers. Since I'm pretty agile and have a lot invested in intimidation I think that could work well together, I have one (or two) bag of tricks and he another. Seems better than both of us intimidating the same guy, even though I guess that could work if we take turns of shouting/hitting. Fourth the fact that I as a huscarl am affected by my lord's leadership edges, if any. Not to put any pressure on how you build your character, bladerunner, but you could keep that in mind as you look for that second edge. With no followers they seem pretty worthless, but since I count as your follower it's not quite so bad! Fifth and last was the second thing about huscarls, +2 on the kinship table. What's that about? Willard skrev: Thanks for the feedback! Willard skrev: My primary reasoning was that it's the primary trait for both Fighting and Throwing. With only d6 in Agility those skills would be more expensive, and I'd have to drop two points of something else. Sounds like you've got a plan. Well, as far as I know swords were traditionally a rich mans weapon and axes much more common although a veteran huscarl certainly should have a good sword and why not an axe too! I like your solution to this age old conundrum. We do not really use miniatures although we usually use basic maps and tokens scavenged from some board game. You do not need to bring any miniatures really. Willard skrev: Third was Wiglaf's desire for taunts and other Smarts based combat maneuvers. Since I'm pretty agile and have a lot invested in intimidation I think that could work well together, I have one (or two) bag of tricks and he another. Seems better than both of us intimidating the same guy, even though I guess that could work if we take turns of shouting/hitting. Sounds like we will have a pretty well rounded group. Willard skrev: Fourth the fact that I as a huscarl am affected by my lord's leadership edges, if any. Not to put any pressure on how you build your character, bladerunner, but you could keep that in mind as you look for that second edge. With no followers they seem pretty worthless, but since I count as your follower it's not quite so bad! Sorry to disappoint but although I gave it some thought I decided to skip leadership edges totally. My last character strived to become a leader and it works really well in Savage Worlds which handles large battles very well but in this one-shot I decided against it. @Dave: will we be able to get that edge that let's us share bennies this time around as well (forgot what it's called)? Willard skrev: Fifth and last was the second thing about huscarls, +2 on the kinship table. What's that about? Basically it's a way to ask for support from your family and certain things modify the roll. Such as being a huscarl apparently. Återgå till "Rollspel - Old"